As far as is known the GWR only built two running sheds specifically for Railmotors, one at Southall on the main line out of Paddington, and one at Chalford on the Stroud Valley line. All other vehicle allocations were to established steam sheds, where they were stabled and serviced with all the other locomotives. A part enlargement of a 1905 GWR drawing showing the shed location, including an amendment done in 1916 after the fire destroyed the building and a wooden coal stage was built at the end of the adjacent siding. The Chalford shed was of wood frame construction clad with corrugated iron, with smoke troughs ventilated through chimneys in a curved roof, and was situated some 200 yards east of the station buildings adjacent to the UP (London) line. The shed was about 130‘ long, 15 ½‘ wide and 18’ to the roof ridge. Track length inside the building was 126’, and a pit was constructed outside the building for ash disposal. No coal stage was provided, coaling the railmotors being done direct from a wagon stabled on an adjacent siding, which also was used to stable a gas tank wagon to provide replenishment of the railmotor’s lighting cylinders. A tank was erected to supply water at the yard entrance. 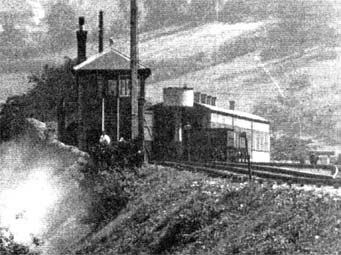 The shed and watering facilities were provided for the commencement of services between Chalford and Stonehouse on 12th October 1903 at a cost of £720, and lasted until the night of 8th January 1916, when the shed was burnt down in a mysterious fire that also destroyed Railmotor No 42, which was stabled in the shed at the time. Although the need for a new shed was acknowledged, no replacement was ever built, the railmotors being stabled and serviced in the open after that date. The Southall shed was larger than the one at Chalford, being some 200’ long, and 19 ½’ wide. 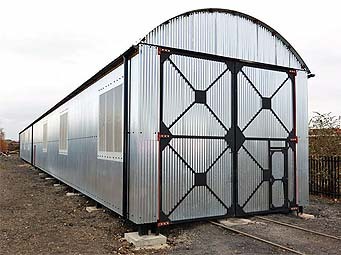 This shed was of iron frame construction rather than wood, and was clad in corrugated iron. There was a smoke trough running the length of the building venting through chimneys, and a pit ran most of the length inside the building. It was built in 1905 at the London end of Southall station, near the engine shed, adjacent to the curve of the Brentford Branch, and seems to have been “squeezed in” to a plot of land next to a margarine factory. A photo, taken from publicity leaflet produced by the margarine factory in 1912 shows the rail motor shed on the right, the Brentford Branch in mid photo, and Southall’s engine shed on the left. The main line to Paddington can just be seen on the far left. It also shows the modified roof vent arrangements fitted to the shed soon after construction. 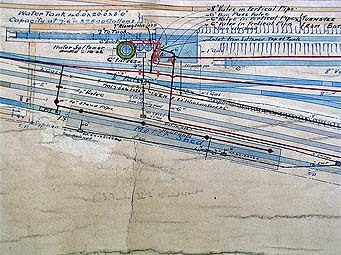 The original GWR 1905 plan shows the track running through the building for about 100’, terminating in a stop block. This (according to reports) incorporated a wooden coal stage, but a photograph from 1912 shows no evidence of this structure. There is some evidence however that the coal stage was constructed on the stop block of a siding that terminated adjacent to the external pit. 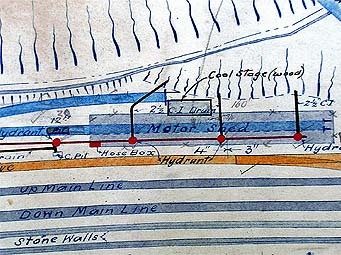 (shown in brown at the left hand side of the plan) The shed was equipped with water and gas hydrants fed from the main engine shed. 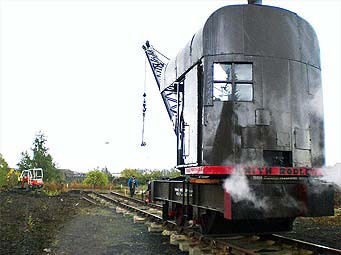 The early roof modification of fitting a louvred vent running the length of the roof was to improve the ventilation, the shed being notorious for the volume of smoke and dirt, so much so that it was normal practice to service the railmotors over the external pit, rather than within the building. 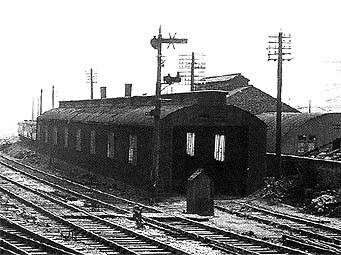 The photograph shows the shed in later days after rail motor services had terminated and the external pit was filled in. At this time the building was used to house Auto Trailers. The pile of debris against the wall is the location of the buffer mounted coal stage. 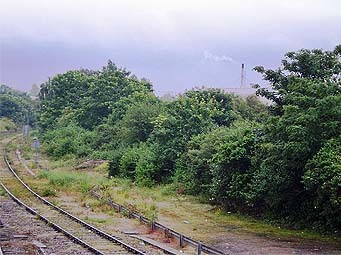 The Southall site in 2008, with the shed demolished, and the boundary wall hidden behind the trees. The margarine factory is long gone, replaced by a conglomeration of small industrial units. The Brentford branch is however still in situ, although now singled. Both this and the previous photograph were taken from the footbridge that spans the GWR main line to the east of Southall station. The GWS took the decision at a meeting of all interested parties in August 2007 to recreate one of the sheds at Didcot to house the Society’s rail motor No 93 together with trailer No 92 when restoration of the vehicles is complete. The decision to opt for a replica of the all steel constructed Southall shed was probably wise, bearing in mind the fate of the Chalford shed. The plan to construct the building is dependent on the Society obtaining ownership of the site, as obtaining the funding for construction would be virtually impossible until this is achieved. As the building will be a replica, it is not possible to obtain backing from the Heritage Lottery Fund who will only fund the restoration of original structures, so the Society must obtain funds from other sources. A chronicle of progress to date is given below and will be progressively updated as progress in made. Didcot's small steam crane assists in laying the last length of track on the shed site - October 2009. Didcot's JCB conducting final levelling of the site - June 2010. 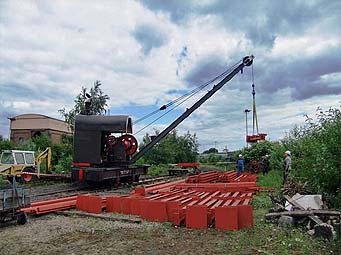 Didcot's small steam crane unloading structural steelwork at the shed site - June 2010. The contractor's digger on site, with the first hole adjacent to the dumper truck. The wagon behind the digger contains the initial consignment of aggregate and cement ready for use - four or five wagon loads will be needed for the complete job. - 12-Aug 2010. 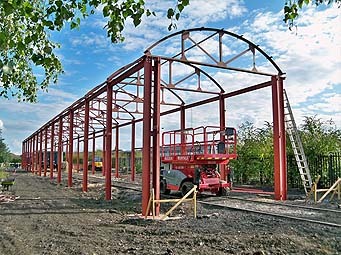 All the main steelwork erected - 9-Sep-2010. 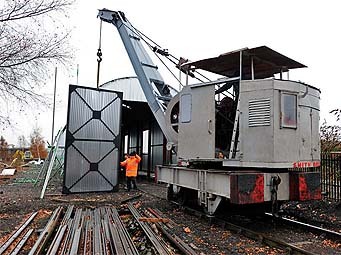 One of the doors being lifted by Didcot Railway Centre's diesel crane - Frank Dumbleton - 16-Dec-2010. A celebratory bottle of champagne being shared to mark completion of this stage of the project. 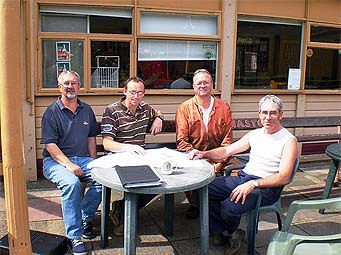 Left to right are Peter Jennings (Project manager for the steam railmotor shed construction), Michael Deans and Max Fois from the contractors who erected the steelwork, and Graham Drew (Project manager for restoration of the steam railmotor and trailer) - Frank Dumbleton - 16-Dec-2010. The completed shed - Frank Dumbleton - 17-Dec-2010. August 2007 Decision to build and site location agreed. The decision was taken to incorporate an educational function within the building to be housed in a separate annex. The main shed to be designed to be as faithful a reproduction of the original Southall shed as possible. December 2007 Site cleared of vegetation. January 2008 Planning permission granted. 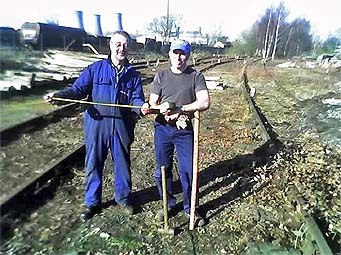 April 2008 Rail access to site route agreed and pegged out. August 2008 Initial detailed construction costings have been prepared and the first planning meeting was held on site at Didcot between the proposed building contractor and the GWS Project team, all communication up to that point being by email and phone calls. The boundary fence between the Branch Line and the shed site was breached in preparation for track extension work to commence, and a GWR style "STOP" board has been restored by the S&T Department in preparation for erection at the current buffer stop location. October 2008 Work has progressed on track laying over the last couple of months up to just short of the shed site. Construction costs have been evaluated, and an affordable building design has been agreed and planned that will see (subject to funding) the main core construction completed in phases within the existing timescales, with some cosmetic enhancements deferred until additional funding is available. However it is with regret that we have to report that due to Network Rail withdrawing from an agreement made over a year ago to sell the Didcot site to the Society all work must now be put on hold until this matter is resolved. - The Society cannot raise and commit funding to a expensive building project on a site that has no security of tenure. - Additional information on this can be found on the Didcot Railway Centre website. January 2009 Problems with site acquisition have not meant that work has stopped on the shed project. 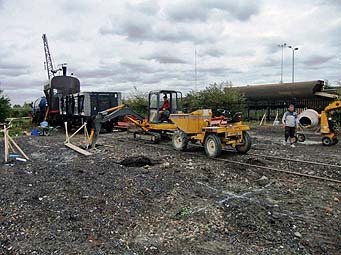 At the end of 2008 the temporary track work had progressed to the shed site boundary, where things will pause until the Project Manager returns from his winter holidays at the end of February. Work on the detailed design engineering drawings for the revised design has been completed, and these are currently being costed and submitted for building regulations approval. Although we are still having problems with Network Rail on Didcot Railway Centre acquisition, work on the shed project has not stopped over the summer months. 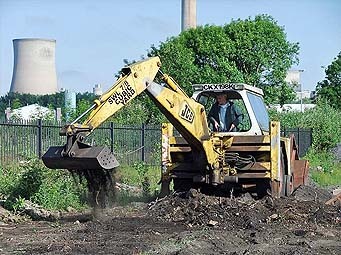 On the practical front building site clearance and leveling has been progressed, with the removal of many tree roots and the redundant sidings from the time BR used the area as a carriage servicing facility. As of mid October the new track work has been laid to the far end of the shed footprint, and it is proposed to extend this to at least two lengths beyond the shed doors to provide a stabling point for the Railmotor outside the building. This work is currently being progressed "in slow time" until we are able to clear the NR problems. Behind the scenes discussions have been held with South Oxford DC Building Regulations Department and the local Fire Service to ensure that we comply with building regs., and we can report that our plans have now been approved. The final build specification has also been agreed with our contractor and quotations received for construction materials. It was hoped to have placed the order for these by the beginning of October, but again Network Rail negotiations are holding up proceedings - both annoying and frustrating at the same time as we could well end up with £1.5M worth of assets on site, and nowhere to put them! The Project Team’s decision to plough on regardless seems to have been the right one. 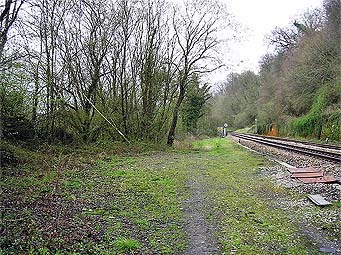 Following protracted and sometimes frustrating negotiations with Network Rail, at a meeting held at the end of November between Network Rail, the Society’s MP, and the GWS Management Team, NR tabled proposals that will allow the Society to commit funds and the construction of the Shed to commence. Activity will now step up a gear (or two) with orders being placed for the construction materials and detailed planning for deliveries and contractor access undertaken. Funding of the Project has also moved forward considerably, with the original donation made by Alan Moore that enabled all the preparatory work to be funded being supplemented by a large donation from the estate of the late Charles Whetmath that will allow all the construction materials to be purchased. In honour of Charles’ considerable contribution to the Project and all the other work he undertook for the Society over the years, we have decided that the shed will now be known as the Charles Whetmath Building. Early March saw the contract for both supply of materials and building construction placed with our preferred contractor, with deliveries of materials due to commence in June, and construction to commence soon afterwards. The contract is for the supply of all the structural steelwork together with cladding and main doors together with construction of foundations and erecting the building. This will allow the Railmotor & Trailer to be housed under cover when they return from Llangollen, but regretfully will not allow public access until the building is fully fitted out for safety reasons. This will require expenditure of additional funds that are currently not to hand, but fundraising will continue until the project is completed. Following on from placing the contract in March, the first delivery of construction materials was made on 17 June. This was made by road transport to Didcot's West Yard for trans - shipping onto site using the Society's own wagons, and subsequent unloading on site using the small steam crane. With the access trackwork complete and a buffer stop fitted to the end of the line, the complete site has now been graded level using the Society's JCB in preparation for the contractor to start work in July. Please note that during all phases of construction the building site is under the control of the contractor, and all members of the public, volunteers and Society members are forbidden entry, except with permission of the Project Manager. Your co-operation in this would be appreciated. At about 2.30 on the afternoon of Thursday 12 August work started on the building, with the digging of the first of the hole for the foundations. The previous couple of days had seen the plant and machinery transported to site from the West Yard, and the final marking out to ensure that we will erect the building on the correct alignment. By the end of August the footings were excavated, the building inspector had visited and agreed all was in order, an estimated 120 tons of aggregate had been used, and thirty five foundation pads completed. Over a four day period at the start of September all the heavy structural steelwork consisting of thirty main uprights and the corresponding fifteen main roof trusses, together with purlins and cross bracing was erected using Didcot's small steam crane, leaving only the lighter cladding supports, main doors and the annex to be fixed in place. The complete exercise was like a large ‘Meccano’ set, and to the credit of the contractor, only one item, out of the 160 or so, was incorrectly placed and required repositioning. By the middle of the month the scaffold had been erected and cladding had been applied to one side and part of the roof. The photo shows the complete length of the building from adjacent to the original site boundary, and is the view that visitors will first see when approaching the site. At this stage the far side and annex together with the remaining roof and top vents have yet to be completed. December 2010 The steel structure of the steam railmotor shed at Didcot was completed on Thursday 16 December when the doors were lifted into place and hung on their hinges. This provides a weatherproof building to house No. 93 when it returns to Didcot in the spring.